Elevator Market size will likely surpass USD 130 billion by 2025; according to a new research report by Global Market Insights, Inc. Rapidly increasing building & construction activities in the Middle East will augment the elevator market development in the study period as the product is extensively used for vertical transportation of goods and people in buildings, apartments, and high-rises. The Middle East construction industry has been witnessing a boom since the last two decades mostly due to rising GDP, improving living standards, and urbanization. The construction sector in the Middle East & North Africa region was valued at more than USD 220 billion in 2016 and is likely to exceed USD 320 billion by 2020 with a net growth of around 40 percent. Iran, Saudi Arabia, UAE, and Qatar will be the key countries in this region which will drive the construction sector growth. The global elevator market is also likely to be propelled by increasing construction of skyscrapers in Middle Eastern countries. Upcoming mega events in Middle East countries including Dubai Expo, 2020 and FIFA world cup, 2022 will also lead to rapid infrastructural development which will in turn drive the lift market growth till 2024. High installation and maintenance cost associated with the product has been the major factor hindering the lift market growth. Along with high installation cost, product end-users are also required to design and construct buildings in such a way that elevator installation is feasible and easy. The product also requires regular maintenance and servicing for proper functioning and accident prevention. Although product manufacturers are trying to lower the initial cost of lifts and their installation, their maintenance and service costs make up for a substantial amount. This may restrain the elevator market growth in the study period as potential end-users with limited requirements will refrain from using the product for their vertical transit purposes. Hydraulic & pneumatic product segment held around one-fifth of the overall elevator market size in 2017. The segment is likely to grow with a CAGR above 3% during the study period. Hydraulic product type is driven by a piston at the bottom which pushes the elevator up as an electric motor forces a hydraulic fluid into the piston whereas the pneumatic products type is driven by the action of compressed air. Both these product types are characterized with lesser installation and maintenance cost and are suitable for low-rise applications. Among the end-users, building & construction accounted for the majority of the market share in 2017. Residential building & construction sub-segment is likely to gain by around 5% CAGR during study period. This segments growth will be augmented by increasing residential building construction activities in emerging economies of the world such as Malaysia, Peru, Chile among others. Institutional building & construction sub-segment is also a key end-user in the global lift market which is likely to grow by above 4% during study period. North America is a key lift market which is likely to grow with more than 3% CAGR during the study period. 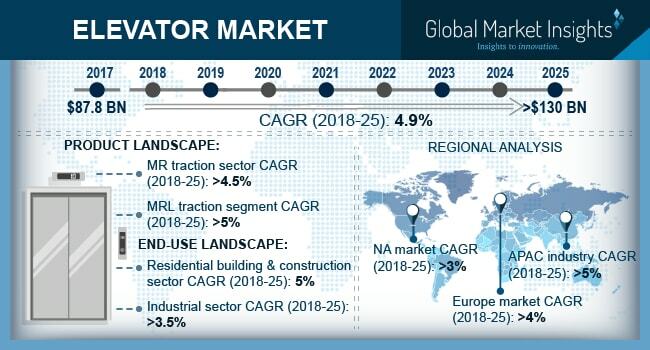 Although new building & construction activities is not very prevalent in North America, building refurbishment and renovation will be the major driver for elevator market growth in the continent. Strict building and safety codes in the U.S. leads to frequent maintenance and repair activities for lifts, propelling the product industry development during the study period. The global elevator market is characterized by the presence of several large-scale manufacturers such as Otis, KONE, Thyssenkrupp, Schindler, Fujitech, Hitachi, Mitsubishi, Toshiba, Hyundai, etc. Medium-scale manufacturers such as Escon Elevators Private Limited, Express Lifts Limited, Glarie, Eita, etc. are also present in the industry. Apart from these companies, several smaller manufacturers are also operating in the lift market. These smaller players are catering to demands from local customers and their sales networks are limited to their respective geographical areas.